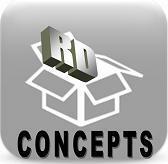 RD Concepts started as an idea in 2005 of bringing people's concepts to reality (original motto was "Conceptual to Creative"). Over the years, we have grown from a strictly Windows environment into mobile, web and Chrome environments. We also are not strictly just a computer company as we also handle Legal Nursing Consulting. As well as our website, we are also on Facebook, Twitter, YouTube for demonstrations, WordPress for blogging, and PayPal for payments. To reflect the ideas and growth of the company, our motto changed to "keep moving forward" to attain the professional goals of the company and its customers.